The twentieth century saw more than its share of authoritarian leaders. Hitler, Mussolini, Stalin, Ho Chi Minh, and Mao Zedong spring immediately to mind, but there were many more and they spanned the globe: Ferdinand Marcos in the Phillipines, Papa Doc Duvalier in Haiti, Idi Amin in Uganda, Pol Pot in Cambodia, Juan Peron in Argentina, Joseph Tito in Yugoslavia, Fidel Castro in Cuba, Francisco Franco in Spain, Slobodan Milošević in Serbia, Saddam Hussein in Iraq, and others. Many became despots, bypassing legislatures and judicial systems and doing as they pleased, up to the point of killing or having killed millions of their citizens. The worst of these, was, of course, Adolph Hitler. He came to power by instilling fear into an already unsettled citizenry and promising that he, and only he, could make Germany great again. He blamed the country’s ills on communists and liberals and homosexuals and gypsies, and, of course, his favorite scapegoat, Jews, all populations that were well-integrated in German society. By relying on his speaking and writing abilities, by painting a picture of imaginary threats and conspiracies, by creating a force of brown-shirted thugs, and by manufacturing crises, he was able to place himself in a position of absolute power, which of course, he abused absolutely. Hitler was an absurd little man with an absurd little mustache who threw the world into crisis for more than ten years and caused the deaths of more than 60 million people—most civilians. Donald J. Trump is an absurd little man with an absurd haircut who used Hitler’s tactics to become President-elect of the United States. Along the way he repeatedly lied about anything and everything, advocated and condoned violence against protesters, ridiculed the press, called Mexican immigrants rapists, blamed the country’s problems on Muslims and other immigrants, proposed mass deportations, courted the Ku Klux Klan and other white supremacists, bragged about sexual assaults on women, and threatened Democratic candidate Hillary Clinton with prison. He suborned treason by calling on Russia to hack U.S. e-mails and revealed classified details of his first national security briefing. Echoing Hitler, he says he and only he can make America great again. The primary way in which Trump differs from Hitler is his wealth—Hitler was poor and for a time homeless. Trump used a multi-million dollar loan from his father to make himself a rich man—not nearly as rich as he claims to be, but rich enough. Another difference has to do with patriotism. Hitler worked tirelessly in his misguided attempt to improve the lot of his country and his countrymen (or at least his ethnic German non-gay countrymen). Trump has spent his entire life lining his coffers by swindling investors and workmen, peddling substandard goods, evading taxes, and stoking his ego on television while doing absolutely nothing to benefit his country or its citizens. The ascension of Donald Trump to the Presidency of the United States will place an authoritarian figure in the most powerful position not only in the United States, but in the entire world. He will be in charge of the most powerful military force in the world and able to launch nuclear missiles on a whim. With the aid of a Senate and House of Representatives which are Republican-controlled and a Supreme Court he will be able to stock with reactionary right-wing judges, he will be able to dismantle laws and regulations protecting immigrants, racial and ethnic minorities, and LGBT communities. He will be in position to reverse environmental and workplace protections, remove LGBT people from the military and women from combat roles, reinstitute waterboarding and other forms of tortures, renege on NATO and other treaties, trade agreements, and accords, allow Putin’s Russia to attack and absorb Eastern European nations and continue to interfere in our political processes, and turn the nation’s police forces and immigration service into stop-and-frisk predators who will target and harass people with dark skin—and all of this if he respects the authority of the Legislative and Judicial branches. He will not do that. 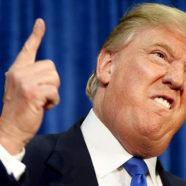 Instead, he will inflame the passions of people who wish to be ruled rather than governed and use them as tools to attack those he perceives as enemies—transgender people, gay men and lesbians, Hispanics, Blacks, the press, politicians who do not grovel before him, progressive voters, anyone who dares to disappoint or criticize him, and especially Muslims. It Trump continues to follow Hitler’s trajectory—if he manufactures crises or otherwise convinces a substantial portion of the American public to further empower him, if he continues to prod his “deplorables” until they coalesce into an army of brown shirts, or even if he doesn’t but manages to stay in power, we will see the Constitution shredded and Congress and the courts bypassed and rendered impotent. When this happens Trump will become the same foul dictator he has already shown he can be in his business dealings and on the television screen. He will be able to do anything he wants—and his vindictive nature, lack of impulse control, developing senility, and failure to understand why nuclear strikes are not an option portend a dark future for us all.